Valerie took fit living to another level. She completed Jamie Eason’s LiveFit Trainer twice, shed 24 pounds, and built a powerful podium-worthy physique in one year! I've been an athlete my entire life. At age six, I starting running track and swimming. My entire family was athletic. Food was never an issue for me and sports came naturally. I continued playing sports throughout high school and received a college track scholarship. My freshman year of college was a hard transition for me and I put on 20 pounds. That's when my up and down weight problems began. Although I was on the track team and worked out, my diet was horrible. Late-night food runs only added to my weight gain. During my sophomore year, I decided to change how I ate and started eating smaller portions and healthier foods. I was able to lose the 20 pounds I gained and kept it off for two years while I finished my track career. After college, I taught group exercise classes, but my eating habits started getting bad again. When my husband and I met, we went out to eat often and ate ice cream nightly. The habits continued after we got married in 2009. I weighed 145 pounds at that point, which was my highest ever, and wore a size 9. I was unhappy with myself and uncomfortable in my body. I went from a size 2 to a size 9 in one year. When I got pregnant with my son in 2010, I worked really hard to make sure I ate healthy and exercised. I only put on 35 pounds during pregnancy and was able to lose it after, but I still held onto the 20 pounds I gained after college. As a fitness instructor, I felt very insecure. How could I help motivate someone when I struggled myself? I was constantly doing cardio, but I wasn't seeing the results. My clothes didn't fit and I no longer felt like the athlete I once was. In 2011, I moved from Atlanta, Georgia, to Charleston, South Carolina. I was a stay-at-home mom and decided to do something. I wanted to be fit and look like some of the people who inspired me. The person who inspires me most is Jamie Eason. When she came out with her 12-Week LiveFit Trainer, I decided to give it a try. I started a Facebook page and a blog that includes recipes and workouts for people who are new to clean eating and exercise. I started Jamie Eason's LiveFit Trainer in September 2011. I made a commitment to finish the 12-week program no matter what. In the beginning, I was afraid I would fail or give up. I tried many times to lose weight and was unsuccessful, so I wasn't sure if this program would work. Exercising wasn't new to me, but clean eating was. I had never heard of it and didn't know what it meant. The 12-week program helped because it included meal plans and shopping lists. Within the first month, I lost five pounds. My clothes were getting loose and I was excited and motivated. I wanted the weight to come off fast and spent many days complaining to my husband. I wanted abs and toned legs and felt like it was taking forever. He was supportive and encouraged me every day. Music kept me motivated in the gym. I also looked to BodySpace and fitness pages on Facebook to keep me inspired. It was nice seeing others with the same goals. Dieting was the hardest part for me. I ate junk food and candy before and gave it all up. To help with my sweet cravings, I came up with clean recipes for pancakes and muffins. These clean foods enabled me to enjoy the foods I had before, but in a healthier way. By the end of the 12 weeks, I wanted clean foods more. I no longer craved unhealthy food. 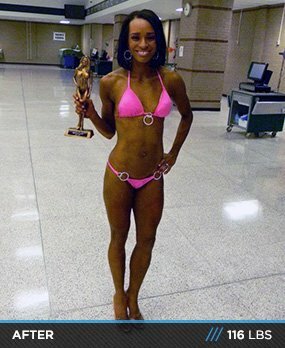 After completing Jamie Eason's LiveFit twice this year, I entered my first bikini competition and placed second. I enjoyed the experience and want to do more to help others. 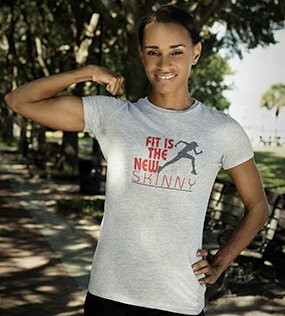 I'm currently studying for my personal training certification and just started a non-profit organization to help combat childhood obesity. Write your goals down and don't limit yourself. Try working out with a friend to stay motivated. Never give up. It may get hard, but stay focused on your goals. Take measurements and pictures and throw out the scale. Change will only come when you do something you have never done. Bodybuilding.com gave me the resources I needed to transform my body. Everything you need is on the site. I love the workouts and the articles most. I'm always looking to learn new things and expand my knowledge. When I need supplements, Bodybuilding.com is helpful and I always receive my packages fast.